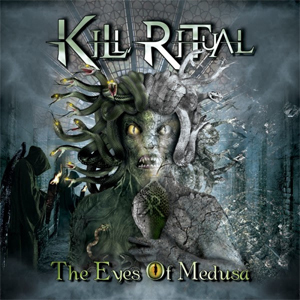 KILL RITUAL Stream "The Eyes Of Medusa"
SF Bay Area Metallers KILL RITUAL, featuring former members of IMAGIKA and DARK ANGEL, are streaming the title track of their upcoming album, The Eyes Of Medusa, due out April 4th via GoldenCore Records/ZYX Music. Listen to "The Eyes Of Medusa" below. Recordings were done at Fossil Sound; San Jose CA and Fang Studio; San Mateo CA. Production/engineering was again handled by KILL RITUAL guitarist Steven Rice. Mix and master completed by Steven Rice & Andy LaRocque (KING DIAMOND). The cover artwork for the CD was created by Jobert Mello of Sledgehammer Graphix (SABATON, PRIMAL FEAR). Formed in late 2010 by former IMAGIKA lead guitarist Steven Rice, KILL RITUAL was completed by former DARK ANGEL bassist Danyael Williams, Bay Area vocalist Josh Gibson and Italian drummer Gee Anzalone (BRAIN DAMAGE).